No matter how prepared you are, it’s always good to know how to use your resources in the most effective ways possible. A good survival knife can help you out in a crunch in unexpected ways. From shelter to cleaning game, a knife is a truly versatile tool to have around. By familiarizing yourself with some simple tips and techniques, you can make your already very useful knife even more beneficial to you in crucial situations. Take a look at these tips and tricks to fully master your survival knife. First thing’s first- Get yourself acquainted with what survival knives are all about. Now that you know what you’re working with, here are the top ten tips and uses of survival knives. Keeping warm is vital in survival situations. Learning the skills to use your knife for tinder gathering and fire starting could be the key to your survival. Creating a bow drill is made much easier with a good survival knife and some know how. You’ll have a fire going in no time if you master this technique. Using your knife to cut down materials to create a shelter will keep you out of the elements. Rope is invaluable in a survival situation, and having a knife that aids in you in making your own would make your survival all the simpler. In a situation where hunting is necessary, fashioning a tool to do would be vital. A survival knife could be used to carve many tools in a survival situation. Knives can be very useful in the preparation of game. Preparing your game to cook is made much easier with a good survival knife. Having a weapon on hand when encountering predators could save your life. Never leave home without your survival knife! Knowing how to use your reflective surface to signal your distress could be your way to safety. Here’s a video showing some of these techniques in action! Want a survival knife of your own? This is the finest article on knives that I have ever come across!!! Thank you for your knowledge and care. 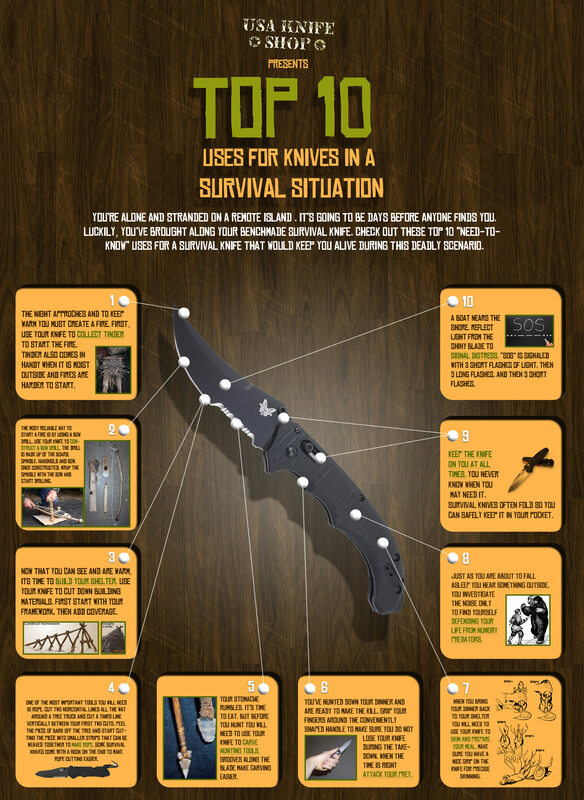 Images describes more than content and these top 10 uses of best survival knife. I might want to compliment you for this incredible feature tips.I know a lot about pocket knives but I’m still learning about survival knives.There’s so much data and changing conclusions out there, a debt of gratitude is in order regarding showing the truths and helping me to get a reasonable understanding of what I ought to be considering and considering for my first survival blade buy and I want to recommend this video tutorial what is really helpful for the survival knife user. attempted to order a Talon, completed pay sheet, refused to send due to Hawaii in state block. required me to pick another state. well I could not. lost a sale…. Love your site, and who doesn’t love free stuff. Unfortunately being in Canada voids all your offers. I’ll put up with the advertising to keep reading the article though.